The faint outlines of coconut trees around the village of Apataki are 8 miles behind me. That is the distance coconut trees are no longer longer visible from the sailboat’s deck. The expansive lagoon water is all around; it feels like I’m heading to the edge of the Earth… not to a boatyard. Ahead of us is a motu (ie. an island on the barrier reef or atoll edge) about 2 miles wide, separated by a few channels of turquoise blue water. White sand crests the shore, coconut trees sway in the wind. It is a postcard-picture of paradise. This could easily be the site of a eco-resort; but instead of bungalows and sunburnt tourists, there are 20+ white masts poking out above the trees, and occasionally a weathered sailors takes a dip in the water to refresh from the nasty work of orbital sanders, paint, and epoxy. A rickety wooden dock welcomes visitors with their dinghies. A cut-out in the trees leading to the water is presumably the “boatramp”: a mix of dirt and coral rubble that connect sailboats from their home in the ocean, to their maintenance lifeline on land. A large yellow tractor stands to the side, attached to a 60 foot long odd-shaped metal trailer with large swinging pads. This is the hydraulic trailer that lifts boats out of the water. The first thing I notice are the big catamarans dry docked: two 50 foot Catanas, which are over $1M to purchase new. There are more than 30 nice-looking boats in the yard, neatly arranged in an open expanse of coral rubble surrounded by coconut trees. They sit on wood pallets and jackstands as one normally finds at a boatyard. In addition, they are fixed with straps to massive cement blocks on the ground: these are the hurricane tie-downs. 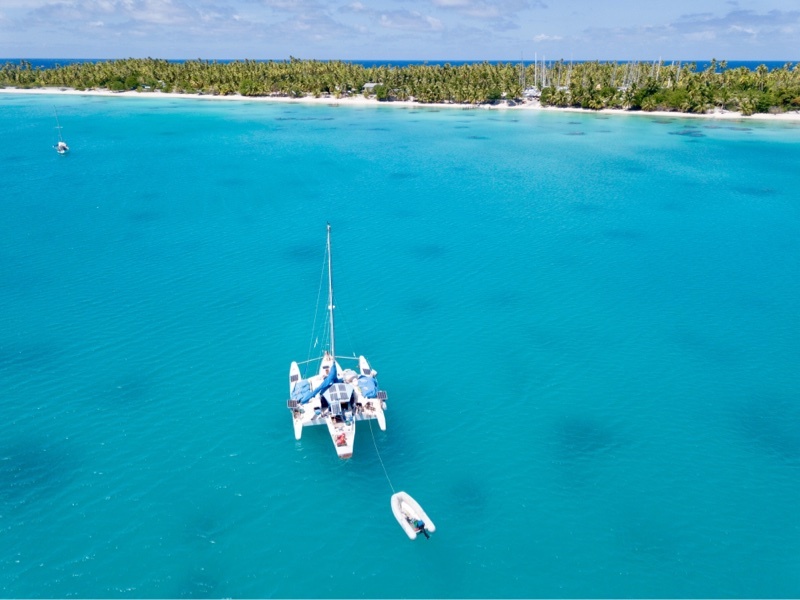 Many sailors leave their boats in Apataki during the cyclone season (Nov-Apr), because it means after they return to their boats, they can easily continue their cruise of the Tuamotu atolls, and not have to bash back upwind from Raiatea or Tahiti. Walking away from the yard, I see rustic metal-roofed buildings, with colorful sun-bleached walls, and orderly gardens devoid of excess clutter. Here is the yard office, the “restaurant”, and various houses for the family that runs the boatyard, and their employees. Coconut husks lay in piles around a copra-drying rack. Copra is the dried coconut meat which is exported from all of French Polynesia. The coconut husks are set alight with flame in metal drums, where they smolder for hours, smoking with a pleasant nutty smell which has the non-trivial benefit of thwarting away bugs. Like an industrial-size incense burner, plumes of coconut smoke gently waft downwind towards the sailboats, which hopefully brings some relief to the sailors unaccustomed to the nasty bites of mosquitos, which come out in force especially in the dawn & dusk hours. “Iaorana,” I call out in greeting to a guy in a red-shirt, screenprinted with the name “Apataki Carenage”, and head to the office to check in. Sounds like yet another place in paradise. What exactly are you planning to do or have done to Aldebaran? It wasn’t that long ago that you hauled her out for repairs to her punctured hull with your nightmare-ish tales of sanding while dripping with sweat inside your protective overalls. Great question Michael— I’ll address it in our next post as it’s a good topic to cover! I forget, why you and other boat owners choose Aataki over larger and more developed Rangiroa. Does the economics of haul out and storage compensate for less infrastructure and supply? It makes no sense why there’s a boatyard in Apataki, it is just by chance that a family that lives here decided to build one. 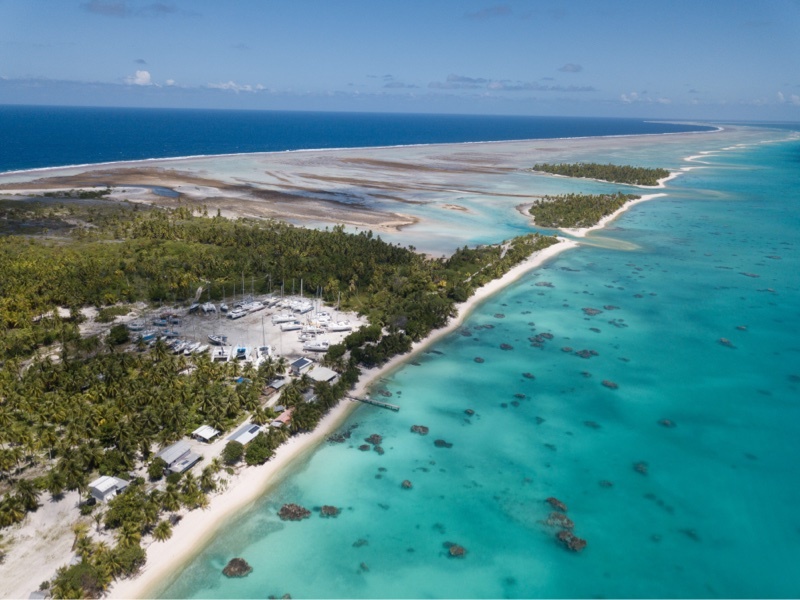 It has lots going against it — the access to food & materials is very limited, the airplane is tiny and impossible to get a seat (requiring most people to fly into a neighboring atoll and take an expensive power boat ride across) and the boatyard is 8 miles from the village. But it’s where it got built, and people seem to want to use it regardless of the inconveniences! Don’t mean to get all ‘philosophical’ on you, but the lucky find the significance of inconvenience pales before the serendipity of life. The search for a ‘good reason’ for everything is so often futile.